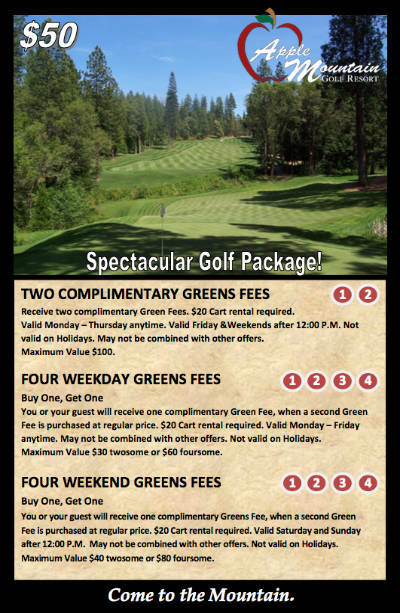 Apple Mountain is proud to offer an exclusive golf package for just $50. Perfect for that Sacramento Area golfer on your list; or get one for yourself and start saving right away. Two Complimentary Greens Fees - $15 Cart rental required. Valid Monday – Thursday anytime. Valid Friday & Weekends after 12:00 P.M. Not valid on Holidays. May not be combined with other offers. Maximum Value $100. Four Weekday Greens Fees - Buy One, Get One. You or your guest will receive one complimentary Green Fee, when a second Green Fee is purchased at regular price. $15 Cart rental required. Valid Monday – Friday anytime. May not be combined with other offers. Not valid on Holidays. Maximum Value $35 twosome or $70 foursome. Four Weekend Greens Fees - Buy One, Get One. You or your guest will receive one complimentary Greens Fee, when a second Green Fee is purchased at regular price. $15 Cart rental required. Valid Saturday and Sunday after 12:00 P.M. May not be combined with other offers. Not valid on Holidays. Maximum Value $44 twosome or $88 foursome.